Having previously impressed with their affordable guitar- and bass-to-MIDI converters, British company Sonuus have brought out their first fully grown effects unit. Designed for both guitar and bass, the Wahoo uses a pair of digitally controlled analogue filters to create all manner of wah, filter and phaser effects. 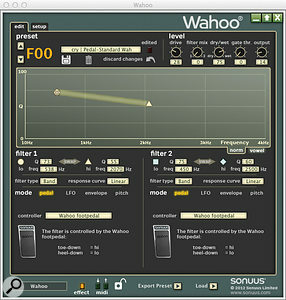 Because the pedal has a digital brain, you can not only store and recall presets, but the pair of filters can be triggered and controlled in all sorts of sophisticated ways using a variety of input sources, ranging from the Wahoo's expression pedal and pair of independent LFOs to the level or, unusually, the pitch of the input signal. 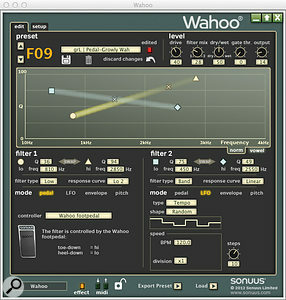 Meanwhile, the Wahoo's USB port and Mac/PC editor software cater for in-depth patch editing, the sending and receiving of MIDI controller messages and tempo-sync'ing of the Wahoo's LFOs to your sequencer via USB MIDI. With such a unique array of features, the Wahoo simply demands further investigation. The Wahoo editor software's ingenious vowel display lets you select the specific vowels sounds you wish to create by using the two filters in tandem. This robust and reasonably compact pedal runs on the standard 9V DC but, being more hungry for current than the average stomp-box, it requires four AA batteries rather than a single 9V cell. It can also be powered from a 9V DC adaptor or, usefully, by the USB bus when connected to a computer. It features a trio of rotary encoders, guarded by some chromed roll bars, and a silent true-bypass footswitch. The expression pedal employs a patent-pending, contactless design that uses an RF proximity sensor to track the position of the pedal. This should not only be extremely accurate but, with no direct mechanical connection, pot or optical sensor involved, also impervious to wear and tear, dirt and moisture. It feels smooth and precise in use, stays put when you take your foot off and leave it in a halfway 'cocked wah' position, and is comfortable to operate both seated and standing. The three rotary encoders offer access to a sizeable array of parameters, from the frequency range, Q and shape (low-pass or band-pass) of each of the filters, to the mix between filters 1 and 2 and the overall wet/dry mix. And that's before you start playing with things like the LFO waveform, the envelope-follower sensitivity or the speed at which each filter tracks changes in pitch! In a sense, it's to Sonuus' credit that every single setting is accessible from just three control knobs and a three-digit LED display. But, as you can imagine, in-depth tweaking can be a laborious process. Thank goodness, then, for the excellent cross-platform editor software, which provides a big, clear and easily understood graphical interface for everything that's going on inside the box. Here, for example, you can set the behaviour of each filter by simply dragging the heel-down and toe-down start and end points of the expression pedal around a frequency graph. Complex, dual-filter patches that mix LFO, pedal, pitch or envelope control can be pulled together as easily as tweaking an effects plug-in. This is a much more gratifying way to sculpt new sounds and, if you wish, you can design and save your presets, then flick the 'lock' switch on the rear of the pedal to prevent accidental adjustments when you're up on stage. Digging deeper, the Wahoo offers in-depth settings to adjust things like input sensitivity to suit the instrument you're using. The 100 user preset slots are joined by 100 factory presets that give a good account of the unit's diverse capabilities. Starting off in traditional guitar and bass effects territory, there's a selection of pedal wah, envelope-controlled touch wah and LFO-controlled auto-wah and phaser-style patches on offer. While the factory settings are a little heavy handed, some judicious rolling back of the wet/dry mix, filter Q and other settings proves that the Wahoo's analogue filters can deliver warm, vintage-sounding effects. However, this pedal is designed for much more than that, and the wide range of each of the controls, combined with the open-ended nature of the editor software, means that you can do pretty much anything you please. 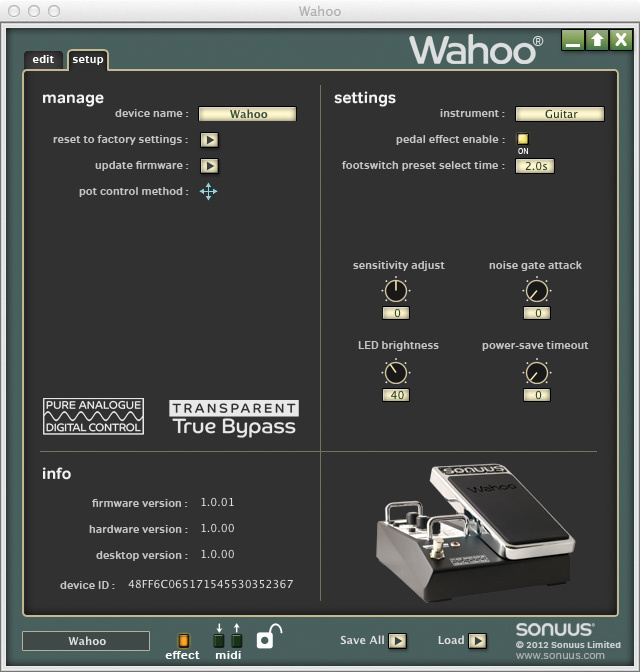 While traditional wah effects use a single band-pass filter to sweep up and down over a set frequency range, here you have two filters that are completely independent and can be separately configured in band-pass or low-pass modes. You might choose, for example, to set filter 1 to sweep the low mid-range when triggered by the envelope follower, while LFO-driven filter 2 sweeps the top end. Beyond the limited range of traditional filter-based guitar effects, there's a world of more synth-like sounds to explore. While lower Q values might be desirable for mellow, vintage-style guitar effects, ramping up the Q creates whistling resonant-filter sounds. When used in combination on specific, separate frequencies, the two filters can also produce distinct vowel-like sounds. 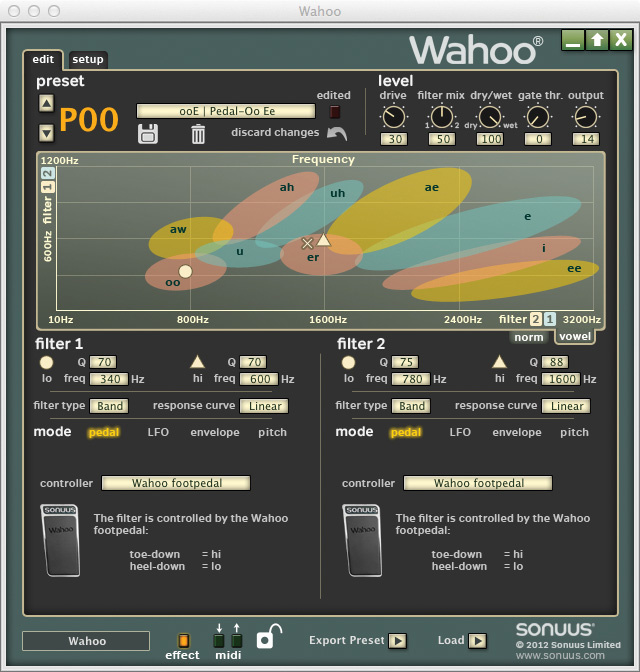 With typical cleverness, the Wahoo editor software offers a secondary view of the frequency graph with the vowels marked on the relevant areas, so setting your wah to say "oo-er” or "ah-ee” is quick and easy. Even a relatively simple effect, such as a traditional pedal wah using a single band-pass filter, can be adjusted is great detail. 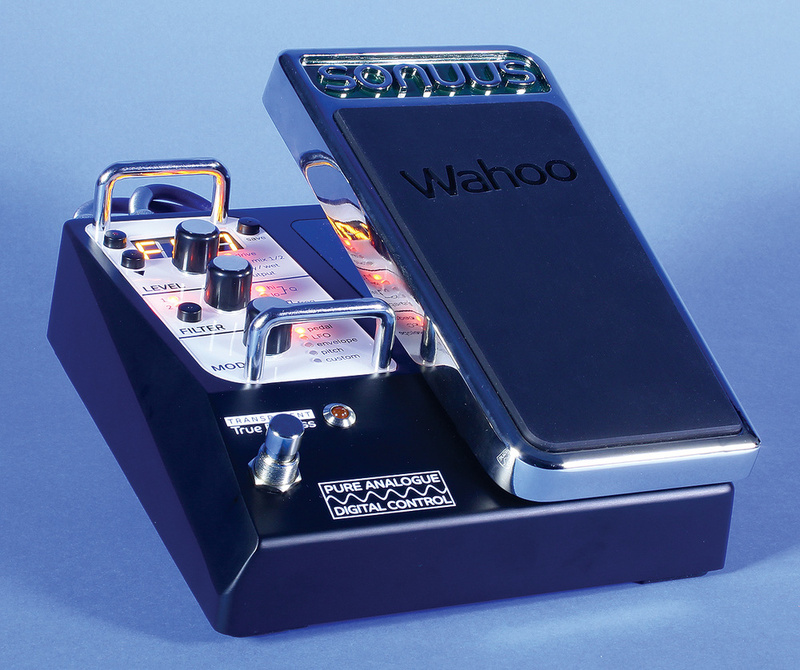 Using the expression pedal to control the filter cutoff frequency will feel familiar to any guitarist who has ever wah-ed a wah, but even here the Wahoo has some new tricks up its sleeve. Each filter has a 'response curve' setting that allows you to change the way it reacts to the pedal, from a straight linear response to a choice of logarithmic response curves which ramp up either early or late. So rather than having the filter cutoff follow the movement of the expression pedal in a 1:1 fashion, you can set it so that most of the sweep happens at the beginning or end of the pedal's travel, with nine increasingly pronounced curves in either direction. The response curve setting also affects filter behaviour in the other control modes. Instead of using the expression pedal, you can choose to sweep each filter with its own LFO. A comprehensive range of waveforms is provided, from sine to random, including a trapezoid waveform with adjustable ramp up and ramp down portions. LFO speed can be set in BPM, by MIDI clock or by tap tempo, set by rocking the pedal back and forth. You can even set minimum and maximum BPM speeds and move between them using the pedal, and there are options to set and adjust the speed and phase of filter 2 according to the LFO settings for filter 1. There's lots of fun to be had here with vowel-sound phasers; low-pass-filtered, 'auto wah meets tremolo' effects; and pairs of alternating, LFO-driven filters. A third control option is available in the form of the envelope follower. As elsewhere, the Wahoo allows detailed and precise parameter adjustment, with settings for sensitivity and attack and decay speed. This was one area that left me — strangely — wishing for less precision. I found that, after some tinkering with the sensitivity and attack controls, you can get the filters to open more gradually and organically as you stiffen the pick attack, rather than suddenly going from 0 to 60 once you pass a specific level. However, the lower strings trigger the envelope follower much sooner than the higher strings — the high E is particularly 'quiet' as far as the Wahoo is concerned — making it difficult to find a setting that feels right for single-note playing across the guitar's range. This has more to do with how magnetic pickups and different string gauges interact than a deficiency on the pedal's part, but a less sophisticated envelope follower might be more forgiving. Of course, this is not so much of an issue in the many situations where you'd use a touch wah or envelope filter in less subtle ways, from rhythmic chords to slap bass. Here, the Wahoo once again sets itself apart by its precision and range of adjustment of parameters such as filter frequency, Q and filter response curve. Previously unheard-of effect combinations are possible, like this wah twinned with a random waveform LFO-driven filter. So far, I've hardly touched on the Wahoo's pitch mode, something that is, to the best of my knowledge, entirely unique among pedal effects. 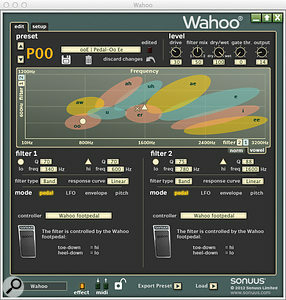 In a bit of inspired lateral thinking, Sonuus have used the pitch-tracking technology from their MIDI converters to provide a fourth way of controlling the Wahoo's filters. There are two ways to use this neat trick: 'bend' mode and 'track' mode. In bend mode, the filter cutoff frequency stays put when you play straight notes and chords but sweeps to the specified point as you bend a note up or down. This can function a bit like an envelope-controlled wah, adding extra expressiveness to note bends during solos without your having to co-ordinate your foot on the expression pedal with what your hands are doing. You can set the bend required before the effect is triggered, from a single semitone to multi-octave divebombs, and even set the two filters separately, one to sweep up when you bend up, the other to move its cutoff frequency down when you slide downwards or bend down with the whammy bar. In track mode, the pitch of the note itself controls the filter frequency. This facilitates a number of interesting keytrack-style effects, such as a low-pass filter on bass guitar that opens up as you walk the bassline up the neck. 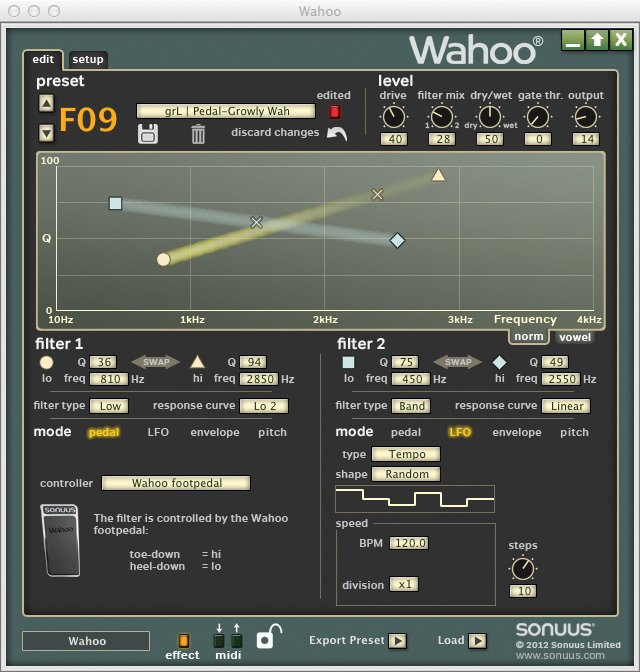 Using a band-pass filter with a high Q, you can also set the Wahoo to follow the note you're playing and emphasise upper harmonics and overtones. Is there anything missing? While mono operation makes sense for the vast majority of guitar and bass players, a stereo version of the Wahoo would open up some interesting possibilities, with one filter panned left and the other right. Otherwise, I struggle to think of a single trick that this resourceful pedal has missed. 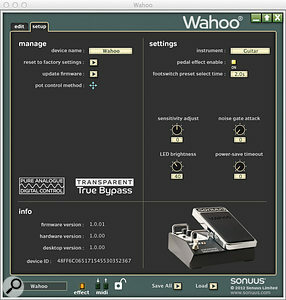 With such a range of modes, so many parameters and so much scope for adjustment, not to mention supplementary features like the built-in noise gate and the filter drive control, Sonuus do seem to have thought of everything — including, in the form of the pitch-controlled modes, something that nobody else has thought of before. Amid all this digital trickery, the pair of decent analogue filters at the heart of the device ensures that the Wahoo's sounds do not disappoint. The things that turn guitarists off digital processing — latency, background noise and sterile tonelessness — are entirely absent. The only danger with a device like this is that, rather than becoming an outlet for your creativity and imagination, the sheer range of tweakable parameters becomes obstructive and you get bogged down in menus and manuals. 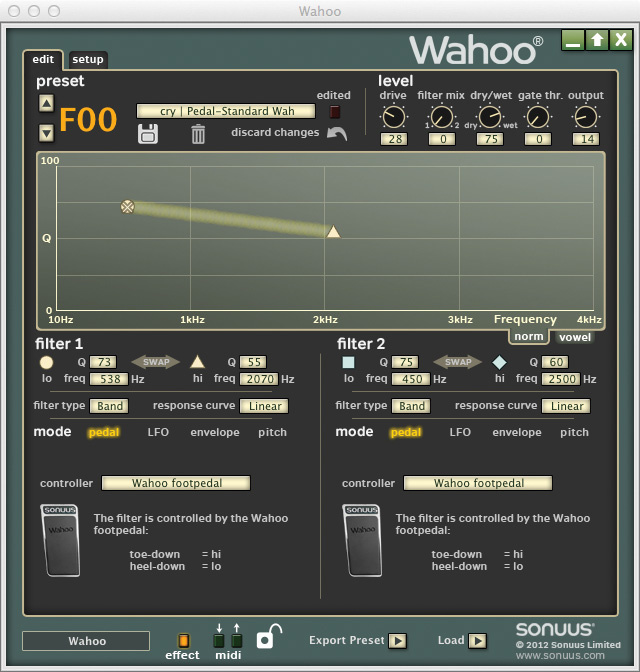 In this sense, the Wahoo's free editor software is its most important feature, letting you access the sound you want quickly and intuitively. Forget 'wow factor': this pedal has 'wahoo factor' in abundance, and playing around with editor software in front of you, the pedal at your feet and a guitar in your lap is enormous fun. Wah enthusiasts will love how they can so easily conjure up a unique wah pedal precisely tuned to the resonant peak of their pickups and tweaked to drive the amp in just the right way. This alone would be enough to convince me of the Wahoo's merits, but it really is just the tip of the iceberg. For fans of all manner of filter-based effects — and particularly guitarists and bass players who like to explore synth sounds and create interesting sonic textures — this pedal is one you simply have to try for yourself. Totally unique pitch-tracking wah and filter effects. Parameters range from vintage effects territory to synth-like sounds. Two independent filters and a range of control methods allow the Wahoo to cover a lot of ground. Excellent editor software with plug-in-style interface. Without the editor software, in-depth programming can be a drag. Envelope follower could be a little more forgiving. Whether you want traditional wah effects that are tweakable in more detail than ever before, or you want to explore new territory with pitch-controlled, vowel-like filter effects, this well-thought-out effects pedal has got it covered. The combination of analogue filters and a clever digital brain mean that the Wahoo adds up to a whole lot of fun.